Tangy beef, flavored with red wine, dill pickles and mustard, will make any fan of German food raise a glass and say Prost! 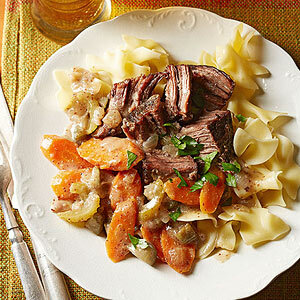 Serve the pot roast over tender noodles or spaetzle, tiny egg noodles available at specialty or European supermarkets. Trim fat from meat. If necessary, cut roast to fit into a 3-1/2- or 4-quart slow cooker. In a large skillet brown the meat on all sides in hot oil. Drain fat. In the slow cooker, combine the carrot, onion, celery and pickle. Place the meat on top of vegetables. In a small bowl combine the 1/2 cup red wine, the mustard, pepper, cloves and bay leaves. Pour over meat and vegetables in cooker. Cover and cook on low-heat setting for 8 to 10 hours or on high-heat setting for 4 to 5 hours. Using a slotted spoon, remove the meat and vegetables from the cooker and place on a serving platter; cover with foil to keep warm. For gravy: Transfer cooking liquid to a 2-quart saucepan. Skim fat from cooking liquid and discard bay leaves. In a small bowl, stir together flour and the 2 tablespoons wine. Stir into the mixture in saucepan. Cook and stir over medium heat until thickened and bubbly. Cook and stir for 1 minute more. Serve meat, vegetables and gravy with noodles. If desired, sprinkle with parsley.